OND quarter of 2017 was an exciting and important quarter for middle earth. 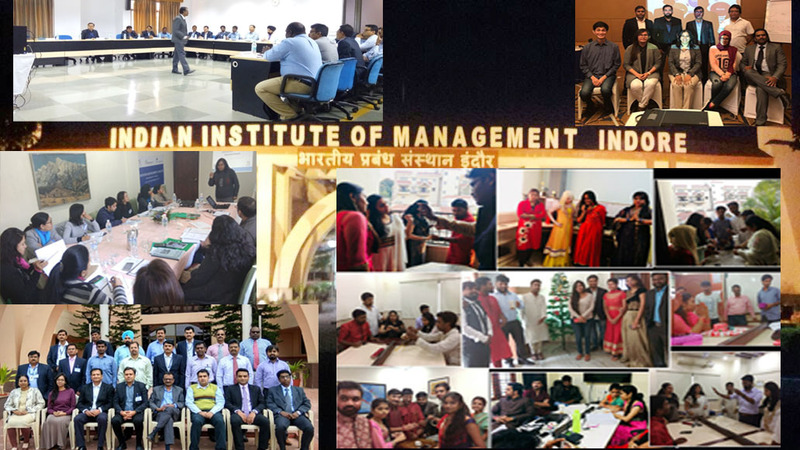 The highlights of the quarter were the launch of the Advanced Strategic management Program ( ASMP ) a nine month program done by middle earth in association with the Indian Institute of Management ( IIM ) Indore. The program was aimed at mangers transitioning for senior manager positions ( normally a manager of managers ) to a strategic role in the company and was designed to be a critical knowledge boost to enable successful transitions. Another major highlight was the opening up of our program calendar in Qatar and Nepal for the first time . CRA workshop was held in Nepal for the first time and two HRBP programs were held in Qatar. Some of the clients we did exciting inhouse assignments were Collabera,Hetero Drugs,Hyundai,Mc Kinsey and ISB. Internally, our HR processes continued to excite participants and employees – MEHR celebrated Christmas festival with the secret Santa fun. The Christmas celebrations was done with great fanfare in true Hyderabadi Fashion with a huge hundi of biryani and a presentation on the significance of Christmas – the entire celebration being organized by our Celebrations committee with Secret Santa gifts and exciting games and grand gala. The birthday celebrations were well organized we also this quarter reached out to even our ex employees where we had some of ex employees coming to celebrate their Birthday at our office. It’s indeed soulful to be your true self. Nothing plagiaristic, nothing imitated and nothing forged… and that’s your soul. You can be only yourself and your very self will speak a lot about you if you remain YOU! After all these articles wherein I mentioned about your personality that depicts some traits of the outside world… you should be wondering, now, what’zz this??? Yes, the external world, knowingly or unknowingly helps you to mold your persona. It’s good too… you need to absorb a lot of positive traits from others in order to be a good being and a sound professional. But, my point here is – in this whole process you should not miss one thing- that ONE BIG thing- YOURSELF! You need to be always yourself. Whatever it is- every self has a uniqueness and you absolutely have no right to destroy that. No imitation,, no influencing or no copying others to such an extent that you lose your individuality. Your individuality is your personality and your personality is your identity. That uniqueness is yourself. Be Unique and Be You. Always remember- there is no one like you. And you cannot be like anyone and most importantly you do not ever want to be like anyone… Right! Why would you? Why would you want to become like anyone when you have yourself sprightly living in you. Why would you miss a chance to exhibit yourself? You need to find that one most critical space- that’s only meant for you. You can be a polished version of ‘someone’ but not ‘someone’. I hope and seriously wish you get me right! Be yourself, there is nobody like you… because in the process of imitating someone you will lose yourself… your own identity. And then the remains will only show someone else and nothing beyond that- the task you performed will leave an impression of ‘like someone’. You will entirely lose yourself in the whole process of trying to be someone else. And, in this entire process, the outcome will only be exhibited as false, pretentious or made-up. The authenticity, the realism will be only seen if you preserve yourself true and uncopied. You don’t want to be a duplicate of someone… isn’t it? Let your uniqueness flow out of you. Allow your exclusivity to flow and flair up, as everyone here is looking for something new. Newness can be only a byproduct of uniqueness. Uniqueness is the new NEW! Get to know one thing- ‘You are unique’ and there is only ‘You’ as ‘You’. No one can replace you so why try replacing someone. Bring out that uniqueness in you. Your individuality will only speak for you. Your action should speak for you… it’s time to highlight your eccentricity. Undoubtedly, you need to learn things from your surrounds. I reiterate that learning happens every day… every moment. You need to grasp things swiftly and understand every passing moment gives you a lesson. But this has to happen without losing your identity. You need to carry forward those learnings in your unique style and that’s where you design your signature style. Be ‘ME’ is all about being ‘yourself’…. Being unique is being ‘yourself’. ‘You’ as ‘You’ are the most powerful being and possess the most influential trait. Portray your uniqueness and rediscover the world. Wearing the HR hat, interacting and involving myself with people, makes me appreciate the fact of staying pure in my thoughts and perception and not losing myself at all. Speed of translating learning into rapid action is one of the major bastions of competitive differentiation. The shifts that are happening in business today are groundbreaking! We are all swimming in the treacherous and unpredictable Lake Michigan together! However, our abilities are different and that’s an incredibly good news! Most of us operate under the illusion that life remains constant and very much within control; what do you think?According to me, this is far from reality. Everything is actually aggressively transmuting. Often the seemingly available choices and situations are murky, uncertain and unclear. Therefore, to succeed in this eruptive environment, we have to learn to swim substantially better than the others. That’s exactly how we shall be able to get to the shore faster than the rest. This definitely requires display of an addictive penchant for learning! Learning fast and furiously, the techniques, tactics and tricks of the trade of swimming in ambiguous conditions and applying them swiftly will only determine whether we are going to stay afloat or not. And not only that, as swimmers we need to be enormously open minded and combative to teach and implement the learning even faster so that we can outshine the rest in the game. GE’s value rose 4000% in 20 years during the tenure of Jack Welch! The data is simply Intriguing! But, facts are facts. Numbers don’t lie. What did he do? Jackis an open minded leader who is comfortably comfortable with uncertainty and change. He surely possesses the “integrative capability” to knit together evidently unrelated pieces of information and ideas. He is an adept craftsman in translating vagueness into robust propositions and at the same time hammering out novel and innovative solutions out of them. He had displayed monumental confidence in making spot decisions even in the absence of compelling and complete data when GE was going throughdifficult times. He has always been an authentic listener and was able to adapt exceedingly well to situations. He has always been an incredible problem solver and thought leader. And most importantly he always had a laser sharp focus on where he wanted to go with the organization. In other words, he was undoubtedly learning agile and a trail blazer and above all, he was a true visionary! It is therefore essential that we focus on two very important capability areas in order to succeed; the first one is,figuring out which direction we want to steer our organization so that it reaches the desired destination on time and the second one is,honing our ability to learn fast and apply the learning even faster. This quote by Seneca proves the point so beautifully well! So the question is, why should one be so clear about the destination she/he is travelling to? Or in other words, why is there a need for us to have a solid purpose? Well, when we set goals, we inevitably acquire a long term vision and at the same time some short term motivation to stay afloat. It also helps us in organizing the most important available resource, time, and certainly the other related resources as well so that we can make the most out of ourselves in reaching the marked destination! However, there is a towering hazard! If we start assigning too much value to the paraphernalia that is anyways necessary to aid us pursue our intent, there is a fair possibility of getting superabundantly entangled in the same. Such as, the obligatory facts, information and skills that we secure to help us fulfil the eventual and crucial objective of reaching the journey’s end! The point of disembarkation could be entering a new market/geo, targeting a new industry segment, building a new solutions stack, mergers and acquisitions, restructuring the organization and its processes, rethinking the business strategy, diversification or for that matter even re-architecting the learning ecosystem; anything for that matter to steer the business in the right direction! It is therefore, relevant to stay intensely connected to the fundamental aspiration and design while intelligently leveraging the tools, proficiency, learning and wisdom to succeed in attaining our fateful port. Honing our ability to clearly define our destination is therefore, incredibly important so that we don’t get swayed away by temptations and prejudices. Staying sharply focused on where we want to go will automatically help us strengthen the other related skills. Next is to perfect our ability to learn and simultaneously apply that learning quickly in order to stay relevant. As responsible leaderswe do carry the obligation to impart knowledge to our people. But, at the same time, is it possible to tutor them on everything they need to know? The answer is ‘impossible!’ The objective should be to enable the workforce with artifacts that they can access at will and their convenience. So, how do we create an environment where our people feel empowered 24/7? How can we ensure that these learners are able to find stuff they need in order to strengthen their knowledge on specific subjects? One of the ways to make certain that learning resources are easily available is to begin curating them. But, then we need to assume the additional burden of maintaining and securing a robust and stable repository. The other option is to go mobile. Mobile is the future of workplace learning. It is not just a casual statement, but something the L&D world today strongly believes in. Well the medium doesn’t really matter. It is all about kindling the desire in people to learn. Self-learning definitely requires the learner to take responsibility for learning. The foremost element is awareness. Our efforts should be directed towards creating this much needed cognizance among our work force so that they are able to discern, decipher and synthesize. Automatically, we’ll see a positive change in their ability to manage themselves as well as the ecosystem effectively. Once our people are able to internalize these two very important skills, we can surely look forward to growth and success in business as well as in personal lives. It is 7 AM in the morning, Ramesh is off to work, as he gets into his self-driven car, the display unit auto-starts and reads out the mails which he has received. While driving, it asks for instructions on what needs to be done to each of the mail, it follows Ramesh’s instructions and types mails accordingly. All this happens while Ramesh is already on the way to work. He gets off the car and enters the office building. As the lift door opens, a camera on the door recognizes Ramesh and confirms whether he needs to go to the 27th floor, to which Ramesh nods affirmatively. He gets off the 27th floor and walks towards his cabin. A few minutes later, he is greeted by a Robot T21 who says that their client has asked for a new feature to be built in the software solution. Ramesh tells T21 to go ahead with the new development and revert in some time as to how it functions. Ramesh is surrounded by Robots,screens, and devices that interact, talk to each other and all of them are fully wired. There is nothing that the devices don’t know that Ramesh knows. The alarm rings and Ramesh gets up bamboozled looking here and there. He then realizes that all this was a dream, smiles at himself and gets off the bed. Though currently dream, is such a situation unimaginable in reality in near future? According to us- absolutely no! We are already looking at technologies and platforms like artificial intelligence, predictive analytics, etc which have made inroads in an individual’s life. This should not come as a surprise to those who are keen observers of the rapid changes taking place all around us. The prediction is that as we move further in life, the lines between the capabilities of man and machine will continue to blur. A lot of work being done by us will be done by the devices. And given the situation in hand, many organizations will need this kind of an arrangement to stay relevant. Having said that, as individuals, how are we preparing ourselves to be pertinent in future? Few software companies have already automated most of the processes.For e.g., AI is being used to detect patterns and enable a user to take decisions. In banks, credit officer’s roles have considerably reduced or have become non-existent due to deployment of credit scoring analytics solutions. Moreover, machines have moved beyond pure data analytics and have entered onto the human emotions realm. Face/Gaze recognition & body-movement recognition software is being prototyped and tested for shopping malls and airports to differentiate between a genuine customer and a probable crook. Tests, to perform surgery all by a robot than a surgeon are underway. Law firms have started deploying AI to reduce the mundane work of research on law case studies and judgements, which was done by law interns…. If a question is posed to you on why is a human relevant till today, what would be your answer? It is the ability to apply “Thoughts”, “Emotions” and/or “Intuition” simultaneously or discretely. Think rationally – recognizing patterns and build perceptions. Reason- Why and why not. Read between the lines; understand the meaning from the story, metaphor etc. Emote: Express / manage emotions like anger, sadness, envy, happiness etc. Interpersonal and social impact: How one connects/collaborates with the stakeholders, communication of feelings like love, hatred, compassion,like, dislike etc. Think instinctively; knowing and managing what is self and not self. Safe guard interests, self, and boundaries. Impulse and gutsy courage to act and take decisions. When we look at the battle of Humanand Machine and correlate them with the thoughts, emotions and intuition as mentioned above; where do you think we are advantaged? Well the answer lies in the question itself. Looking at the trend, it seems that most tasks given to the machine is pertaining to thoughts. One can talk of cognitive learning where AI, predictive analytics and automation can play a major role. We need to get ready for some adverse impact on this side which will be managed by a machine sooner or later. We, Humans, are privileged with managing self and other’s emotions and intuitive decision making. We have to upgrade our application of these gifts to a wider extent going forward. In no era, the onslaught of technological advancements will replace humans. It is unimaginable. The option that we have is to work in harmony and a symbiotic relationship with machines. Though there has been multiple experiments to enable these machines to recognize emotions, they would still lack human touch,won’t they? E-motions as it is ‘energy in motion’, humans would play a major role in connecting with people, keeping them engaged, motivated and energized. Which means that the core of building trust and relationship would still need a Human touch. On the other hand, to achieve accuracy, speed, quality, or any other tangible outcome, machine will be of immense help. Finally, intuition will be required to make decisions where instincts will play a major role. Furthermore, machines will not be able to make many common sensical decisions and would prove to be counterproductive and ineffective. It is easy to upgrade a machine by updating either the hardware or the software. In contrast, adapting and getting used to frequent changes for a human being is a transformational journey. The understanding of this aspect and starting the journey as early as possible will help us be relevant in this fast changing technological world. The horror of the same old thing! We are a culture of “ephemeral enthusiasm”, wrote David Brooks in his recent column for The New York Times. In an era where there is no dearth of information and amusements, we constantly find ourselves wanting more of what we have today and the same which we desired to have yesterday – No more does my latest iPhone or my whacky hairstyle is good (read as ‘kool’) enough. This insatiable desire to change for the sake of change, or out of boredom or even compulsion, has only made it difficult for us to focus on the activity or even with the people right before us. Software available from the times of Windows OS have only paved a way for us to effectively multi-task. However, what we don’t realise is this constant buzz of our gadgets and the cacophony of our human mind has only diminished our true productivity. Yes, it is not easy to focus on one thing, when too many good (read as ‘awesome’) things are happening all around us; especially, when the incentive to focus is not there sometimes. Technologies keep updating, landscapes keep changing, good (read as ‘virtual’) friends keep adding, so on and so forth. C.S. Lewis, in his book The Screwtape Letters, states, “The horror of the same old thing is one of the gross passions of the human heart—an endless source of heresies in religion, folly in counsel, infidelity in marriage, and inconstancy in friendship (sic)”. So, what should be the ideal approach for a professional? Is it wrong for us to lay hands on as many technologies as possible at one go or should we devote our complete energy to learn and contribute to the current task at hand? The answer, I believe, lies in our ability to balance our innate desire to change for the good and the intent to focus on the things that are now and important. Brain studies have proved that if we are unable to pay attention to a stimulus for a certain time, it becomes highly impossible to remember that stimulus later. In fact, researchers like Paul Johnson, argue that our post-internet era brains have changed dynamically. He describes this new phenomenon as “brain plasticity”, where some areas of our brain expand or shrink based on how we use that area. Those who relied on internet (read as ‘googling’) quite heavily activated their “reasoning and decision making” areas of their brain and while those who used internet less often activated their “memory” related areas of their brain. This is evident in the case of the blind people, where their touching sense improves considerably, as the brain area allocated to touching expands. Nevertheless, the main reason for our inability to focus is to do with our ability (read as ‘pride’) to multi- task. We feel inadequate or hopeless if we have or do anything less than our neighbour. And what is fascinating is that we even judge people’s worth based on how busy they look. However, we don’t realise this obsession to focus on multiple activities at the same time has robbed us of our inner-satisfaction in completing any work with quality. In fact, research conducted at Stanford University observed multitasking to be less productive and that which undermines the performance and even the brain of the multi-tasker. Interestingly, another study done by the University of London found the IQ levels of the multi-taskers drop down drastically while doing cognitive tasks, much like a person who smoked pot or stayed up all night! Are small screens leading to tunnel vision? Have you found yourself focusing only on the vehicle just ahead of yours while you ride or drive in heavy traffic, without understanding the actual reason behind the clog?While you try to understand a customer’s problem, are you looking at the nearest literal symptom or a long lasting impact of the problem? Nevertheless, any challenge in our personal and professional lives needs an immense amount of farsightedness to arrive at a permanent, long lasting solution. Else all what we may do to solve problems, may just be a quick fix or a temporary repair. So, what is affecting our farsightedness? The UCLA(University of California, Los Angeles) researchers studied two groups of sixth-graders from a Southern California public school. One group was sent to the Pali Institute (an outdoor education camp in Running Springs, California), where the kids had no access to electronic devices. For the other group, it was life as usual.At the beginning and end of the five-day study period, both groups of kids were shown images of nearly 50 faces and asked to identify the feelings being modeled. Researchers found that the students who went to camp scored significantly higher when it came to reading facial emotions or other nonverbal cues than the students who continued to have access to their media devices. From this research, it is evident that ourability to perceive things at a distance and in detail is compromised due to‘excessive’smallscreen interactions as it limits our vision and thought process to a great extent. Over a period, this habit diminishesour capability to solve problems with a mindset of looking for farsighted and long-lasting solutions to problems and challenges leading to a tunnel vision of things. On the contrary, the good news is that our brain has an innate ability to rewire itself by altering neural pathways. With certain modifications in our behaviors and habits, wecouldadd-on our close distant focus to farsighted focus on things. Recognize device addiction: If you are glued to your devices like small screen smart phones or any other wearable at a dinner table with people around or moving along with them at home/ work all the time, watch out for device addiction! Things that you do to keep yourself physically and psychologically healthy like eating, sleeping or exercising must not have device interventions as the more you have them around, the more your conviction towards your core activities during the day reduces because your attention gets diverted. Practice to sense far: While the most evident behavior is to appreciate what you see the closest, pushing yourself to see more and beyond a limited distance could help you gather more information and enable proactive thoughts to solve critical problems. This could be practiced in simple ways. When you walk on the road, compliment looking at the nearest object with looking at the farthest object as well. This continuous practice would help program your brain to see farther. Be in the present to build future:Your strong impulse of opening a message that popson your small screen gadget while you are in an in-person interaction may divert your attention from the conversation. Your endeavor in such instances must be, givingleast attention to such distractions. Just bepresent at ‘themoment’. Do not let your attention go anywhere else when you are intending to build relationships or looking at long lasting solutions to problems. Hence, be in the present to build your future. Enjoy a device free hour a day: Decide to spend at least one hour a day with someone or with nature. Ensure you do not touch, see or hear any device small or big during this hour. Use this time to connect with someone face to face or with nature like the greens, waters, sky and other natural beauty. One hour device free a day may help you consolidate your attention span and rewire your habits of looking into the small screens. Create screen free spaces: You may create certain device free spaces at work or home that may keep you away from small screens and reduce the impulse of giving most of the focus on them. These could be cafeteria, physical game rooms, yoga rooms, gym etc. These areas do give you a break from the screens therefore, reduce the urge to look at them more often.